I hope this month’s evening weather will lure you outdoors for a wonderful summer evening’s viewing particularly in the East towards Seattle where Saturn and Mars dance around the Moon in the dusk sky! Also at dusk, Jupiter is in the South over Port Angeles; and Venus in in the West over the Sooke Hills. “Stellarium is a free open source planetarium for your computer. Installation is easy on your SmartPhone, PC or MAC. Set your location to Oak Bay, BC (or Victoria, BC). You can move the “time forward” so if it is daytime, you can scroll forward to 11 pm. The image will show the moon already up in the night sky over Port Townsend and Seattle. rising in the SE over Mount Baker. Scroll right and you will see Jupiter already over the Olympic Mountains in the SW. These two images below are taken four hours apart. The first at 11 pm on June 1, 2018 shows the moon rising in the East with Jupiter ahead on the ecliptic. At this time Venus can be seen at the far end in the West over the Sooke Hills. This second image taken at 2:00 am , just 3 hours ahead shows Saturn already risen following the moon, with Mars now rising in the East all chasing the Moon. Venus has now already set in the West. 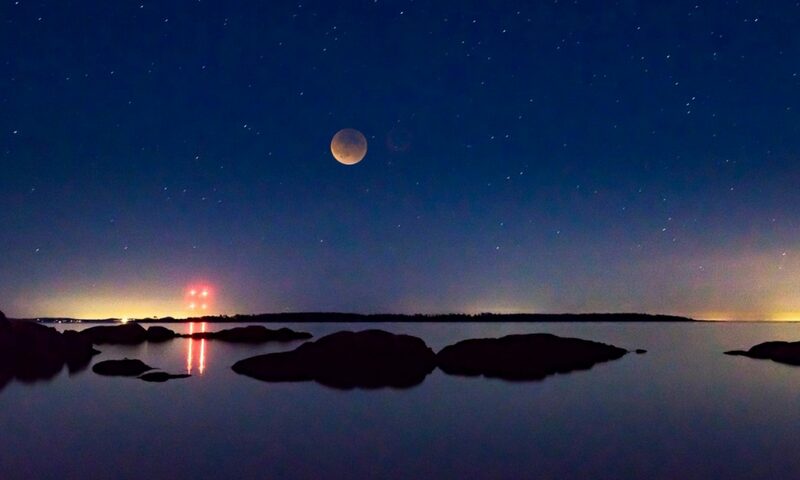 So now you start to “see” the “Salish Walk of the Planets” – the huge arch in the southern sky from East to West where the Sun, Moon and planets all take their daily walk. In astronomy we call the arch the ecliptic. The “walk” is an illusion as in fact it is the 24 hour spinning of the earth that makes the solar system bodies appear to move along this arc. The highest point in the ecliptic (arc) is quite low over Port Angeles now it is summer. There are many videos on Youtube to visually explain this in more detail. All other “stars” which are not solar system bodies, are mostly stars inside our own Milky Way Galaxy or are in fact whole galaxies themselves. The famous photograph taken by the Hubble Telescope is amazing in that almost every spot of light is a whole galaxy. Unlike the planets, Moon and Sun on the ecliptic, all the “stars” rotate anticlockwise around the North Star over 24 hours. Of course they are all “still” in the heavens. It is the Earth spinning that gives this illusion of movement. First up is Saturn. It reaches its highest sunset altitude for the year this month and sets more than two hours after sunset. You can’t miss Jupiter only a month after its opposition–when Earth was directly between Jupiter and the Sun. The best time to observe Jupiter through a telescope is 10:30 p.m. at the beginning of the month and as soon as it’s dark by the end of the month. Just aim your binoculars at the bright planet for a view including the four Galilean moons. Or just enjoy Jupiter with your unaided eye! Saturn is at opposition June 27th, when it and the Sun are on opposite sides of Earth. It rises at sunset and sets at sunrise. Great Saturn viewing will last several more months. The best views this month will be just after midnight. All year, the rings have been tilted wide open–almost 26 degrees wide this month–giving us a great view of Saturn’s distinctive rings. The tilt offers us a view of the north polar region, so exquisitely imaged by the Cassini spacecraft. Near Saturn, the brightest asteroid–Vesta–is so bright that it can be seen with your unaided eye. It will be visible for several months. 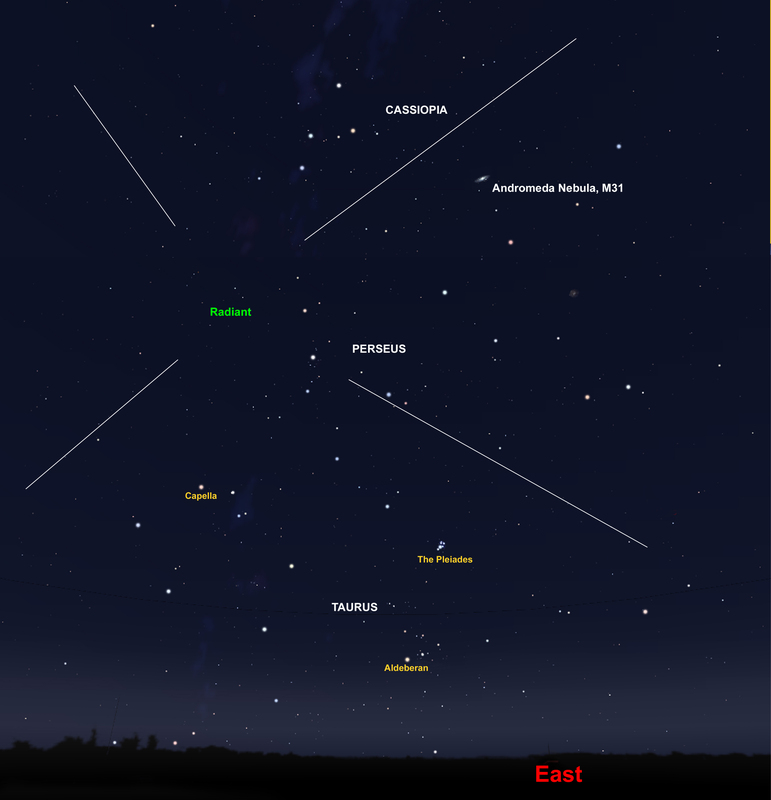 A detailed star chart will help you pick out the asteroid from the stars. The summer Milky way provides a glittery backdrop. Finally, Mars grows dramatically in brightness and size this month and is visible by 10:30 p.m. by month end. The best views are in the early morning hours. Earth’s closest approach with Mars is only a month away. It’s the closest Mars has been to us since 2003. This summary is from the transcript of “What’s Up in June 2018” by NASA announcer and astronomer Jane Houston Jones with specific permission for localization to Cattle Point DARK SKY Urban Star Park and the Oak Bay News. 2017-8-1 : What’s Up in the Sky in August 2017? What’s Up for August 2017? BIG DAY IN USA AND OAK BAY : Monday August 21st 9:00 am : Total solar eclipse traces a 150 km path across the USA. 90% in Oak Bay, British Columbia. Not everyone will be able to drive down to Oregon, to experience the narrow path of totality . Here are some things to look for no matter whether you plan to see it live in its totality or whether you watch it in its 90% penumbra from here in Oak Bay. 90% is NOT the same as 100%, so please make the effort to drive south if you can. Apparently watching at 90% versus watching at 100% is like watching a movie from the lobby compared with being inside. YES here in Oak Bay, much to my delight, we will have 90% coverage. At 90%, the daylight is quite dim, only 10% of normal. The air is feeling quite cool, since most of the heat radiation from the Sun is blocked by the Moon. Be at Mount Tolmie at 8:45 am (For 9:00 am start). The whole experience lasts 2 hrs 20 minutes but the peak is at 10:20 am. The birds will be silent and the wind will feel very strange. This animation is very cool and shows how deep we are in Oak Bay into darkness. Click on the image below. You need to read this even if you think you know the danger we face in Oak Bay. We are uneasy telling you that as it is crazy to risk looking towards the SUN anytime. We strongly advise buying approved solar filtered glasses. You can buy these today on Amazon : Celestron EclipSmart Deluxe 3-Piece Solar Observing and Imaging Kit. Here in BC in the 90% penumbra zone IT IS MUCH MORE DANGEROUS. YOU MUST MAKE SURE YOU and YOUR CHILDREN HAVE GLASSES. The SUN’s disk is never covered as it is in Oregon. Children will hear the cries of excitement from people wearing glasses who can see the partial coverage, and they will be tempted to look without glasses. The official advice is as follows : “So whenever any part of the photosphere is uncovered, it is absolutely essential to view the Sun through a safe solar filter, that is, one that meets the ISO 12312-2 international standard. Such filters are widely available at affordable prices. Looking at the uneclipsed or partially eclipsed Sun through dark sunglasses or any other unapproved filter is a recipe for serious and potentially permanent eye injury. Before eclipse day, pack your eclipse toolkit with a notebook, pen or pencil, a clock, a stopwatch, the front page of a newspaper, a thermometer, and a stick with a piece of crepe paper tied to it. And bring an assistant to help conduct some observations. Download and practice using a citizen science phone app to help you study clouds, air and surface temperatures during the eclipse. A good one is the GLOBE app at observer.globe.com. Go to the location where you’ll view the eclipse and check for trees and buildings that may obstruct your view. Mount Tolmie is recommended here in Oak Bay, But again note we are well away from being to see the full or even partial eclipse. And if you find you and your family without glasses come the day, then we highly recommend you make this simple pin-hole camera . Review the activities you want to do during the eclipse, and jot notes in your journal or notebook! If you are travelling to Oregon with your family, or if you just enjoy thinking about it, here are some notes for Totality. Totality lasts less than 3 minutes, so you may want to focus on doing only one science observation. Or just really experience the eclipse! Don’t waste this once-in-a-lifetime opportunity by watching it on your phone’s screen. Remember this is NOT in Oak Bay. This is for people who have travelled to Oregon. Plan to have your safe solar-viewing glasses within immediate reach – in your pocket or around your neck for quick eye protection before and after totality. Just before totality, if you have a good view of the horizon look west for the approaching shadow. After totality, look under the sun low on the horizon, for the departing shadow. If it’s cloudy, try to see the shadow by looking up at the bottoms of the clouds. During totality, look for stars. Can you see Regulus in solar corona? The stars of Orion? How early and how late is Venus visible? Can you see other planets? Before and after totality, look at the ground. Do you see quivering or moving lighter and darker areas? You may see moving waves of light and shadow – like the patterns you see on the bottom of a swimming pool. How dark is does it get at totality? Look at the newspaper you brought and see what’s the smallest print you can read. Practice after sunset the night before the eclipse, and make notes in your notebook. How much does the temperature drop during totality? Your assistant can help observe and record in your notebook. Does the wind start, stop, or change direction? Tape or tie crepe paper or toilet paper to a stick or post to help you determine the wind’s direction. At what stages of the eclipse do the changes happen? Watch and listen for changes in animal and bird behavior. You can still do a few of the experiments above. Talk to your kids about which they think make sense and why. And let;s all hope for a wonderful clear morning. Be there for the build up at 8:30 am with your StarBucks. Now back to “What’s Up for August”? The evening of August 2nd the waxing moon is at the upper right of Saturn. August 12th and 13th – midnight to dawn: look out for the Perseid meteor shower which is the annual Earth pass through of the tail and debris from the comet Swift-Tuttle. We have a more indepth discussion on the Perseids as seen in BC at bcmeteors.net our local BC Meteor Watchers website.